Paddle conveyors are basically used when material needs to mixed while moving to destination. In a paddle conveyor, the paddles are fitted at regular intervals along the length of the shaft. 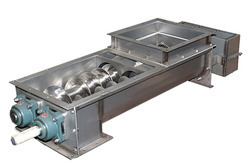 Screw Conveyors are basically for bulk materials with variable properties depending on the application. They can be sealed against dust or moisture, jacketed to act as dryer or cooler. Screw flights fabricated in a array of configurations perform different tasks or help to convey different types of materials. Usage: Textile,Cement,Ceramic,Plastic,Chemical and Food Industries. Our company has gained name and fame in presenting Paddle Conveyor. 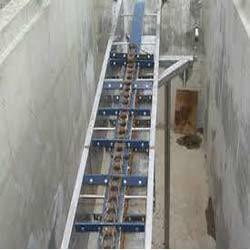 We stand forefront in the row of Paddle Screw Conveyor manufacturer of India. We are geared in the business of manufacturing of paddle screw conveyor and double paddle screw conveyor which are used for various industrial applications. The range of products which we offer to you is appreciated by our clients spreading worldwide. Paddle conveyors are most often used to convey material horizontally and then transition to an incline. They are commonly used for Silo fill up and automatic Plants. TMES Paddle Conveyors are used when material needs to be mixed before reaching its destination. Adjustable paddles provide complete mixing action, and a controlled material flow. Conveying action can be controlled by adjusting the angle of the paddle conveyors. Sturdy, rigid, vibration free and efficient. Used for mixing of chemicals & drugs, spices, minerals, sugar, pulp etc. No increase in temperature due to soft gentle Mixing. These conveyor is designed to load any style of cross conveyor, auger or bucket elevator leg. Wide assortment of accessories available.These bearings are Easy maintenance and visual inspection. Dust tight and weatherproof UHMW seals on shafts.